Every teacher wants her first day of school activities to stand out and help start off a memorable year. It's important to not only begin by creating positive memories but also to help establish a routine and expectations. One of the first things that you should do on the first day of school is establish your students' routines and expectations. Whether you are teaching preschool or sixth graders, your students will perform better and the classroom will be more manageable, if you as the teacher specify ahead of time what you expect. If you are teaching younger children, you may well find that playing games to teach your expectations is an effective and fun way to start the year. For example, if one of your classroom rules is to be quite when the lights are turned off, play a game encouraging children to talk loudly until the lights are turned out. Tell the students you are looking for the first person who can be quiet. However, young children are eager to please and chances are that you will be hard pressed to find someone. In the game of four corners, one person stands in the middle of the room with her eyes closed, while everyone else divides themselves into four corners or areas of the room. The person in the middle names a corner, and anyone in that corner has to sit down. Normally the corners are labeled numerically, but you can put a twist on the game by giving students names for the different parts of the room. For example, students can stand at the "center area", the literacy lab, or the coat nook. This helps young children get familiar with your room. If you have older students, take some time to have them write down some goals for the year. You can start the activity by sharing with your students your goals for them this year. Then, ask them to do the same on a piece of paper. Pull out the goal journals once per month or quarter to help students evaluate whether or not they are meeting their goals. While it's important to set expectations, it's also important to inspire your students and get to know them better. First day of school activities can help you accomplish this. On the first day of school, provide a combination of things that inspire students and motivate them to do their best. Start pre-writing skills by letting your students draw pictures of the things that are important to them. Provide colored pencils and paper and ask students to draw their families, their friends, or their favorite place. Make sure that you bring something special with you to show your students as well. Something fun to do with your class of older students is to take a picture of each student and ask him or her to give a favorite quote. At the end of the year, you can pull out the first day pictures and ask students if they remember their quotes, put up new end of the year pictures, or simply reminisce. To get to know students better, draw a line down the middle of the classroom. Ask students to stand up and then ask a series of questions. For example, ask those who like Pepsi to stand on the left and those who like Coke to stand on the right. This activity provides students an opportunity to get to know each other and recognize things that they have in common with other students. 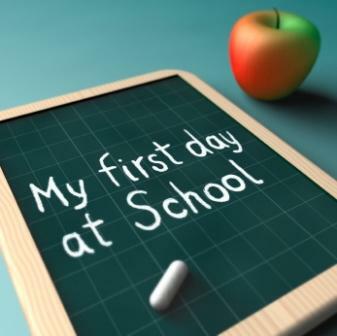 Finding the right first day of school activities can really help the first day back to school run smoothly. Find that balance between setting expectations and inspiring your students. Take the opportunity to get to know your kids since you'll be spending a whole year with them.